Are you looking for live casinos that offer deposits and withdrawals using Solo? Find which online casinos offer Solo as payment method. 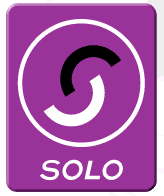 Solo, one of the most popular branded bankcards in Europe has moved to the forefront as a preferred method for depositing and withdrawing online. This card is accepted at many of the major casino websites as a deposit method when coupled with a Moneybookers account. Solo, powered by Moneybookers, makes depositing and withdrawing funds from online simple, safe and secure. If the player does not already have a Moneybookers account, then one will need to be created. This can happen in one of two ways. They can both visit the Moneybookers main website and set up an account there or they may access through the cashier page on most major casino websites. By selecting the Solo logo on the main Cashier page, the account holder will be redirected to the Moneybookers main website to set up the account. Once the account has been created Solo card and adjoining account will need to be linked to the Moneybookers account. This is done by filling out a short form that includes the bank account information and card number. This information is held on a secure server at Moneybookers and is never released to the casino websites, making this a very safe method to use. The Solo card allows funds to be transferred directly into the casino website account with no delays. That is provided that there are funds in the bank account with which to fund the online account. While there are no fees from Moneybookers for depositing on websites using their services, there may be from the bank itself. Withdrawing funds is just as easy as depositing them when using the Solo card in conjunction with Moneybookers. Simply choose the withdraw option on any casino website that has the Solo logo or Moneybookers for funding and the amount of funds that is desired can be input in the proper field. The funds are then transferred to the Moneybookers account that is linked to the Solo card and subsequently can be withdrawn directly back to the bank account that the card is linked to. As the Solo card is issued by a local bank branch, the first option should there be a problem, is to contact the issuing branch. They should be able to assist the account holder with any issues, should they arise. If the issue is found to be with Moneybookers, their support can be contacted directly through their main website.